Finally! A Hectic Planet book that reaches the level of his other work! We get absolute mayhem in the Vroom Socko: Paid in Full segment, mourning over lost girlfriends in the opening segment, and Halby punching a cop and getting away with it. Solid book, and the mark of a good book like this late in a series is that it makes me want to give the first parts a second chance. Now that the characters are fully developed and I know what he was doing all that time, maybe the first parts would come off better. Eh, maybe not. Whatever the case, this is still a great all around book. Better. Still not fantastic, but better. The characters got a lot more fleshed out and there were more genuinely funny scenes. 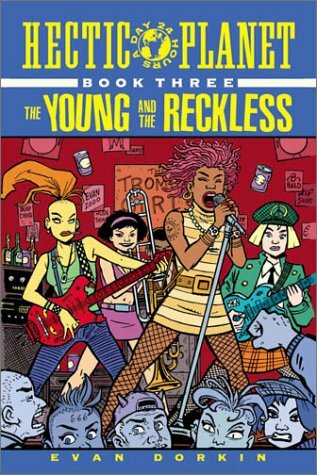 Still perhaps not a necessity for anybody but the most diehard of Dorkin fans, but a good book. Man, I had high hopes for this book. As far as I know Evan has never done anything that I really hated. 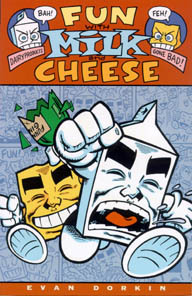 Dork and Milk and Cheese were two of the funniest books ever, but for some reason I had always avoided reading this series. Maybe it was the pirate idea, maybe it was science fiction aspect to the whole thing, or maybe it was because I had gotten the impression that he was taking the whole thing too seriously. Whatever the case, well, it looks like I was right to not jump right into this series with both feet. It’s the story of a ragtag (is there any other kind?) band of misfits trying to make some money in space, essentially. It’s not that it’s a bad book, because it’s not. I just didn’t think it lived up to the other, funnier stuff that he had done. Of course, this is his early work and maybe he just had to find his rhythm. Whenever I’m in a really crappy mood and it seems like nothing is ever going to get better, I turn to Milk and Cheese. Or Magic Whistle by Sam Henderson, if I’ve read Milk and Cheese already too recently. You’d have a hard time finding a funnier book than this… well, at least until the collected Dork comes out, which I’ve heard is going to be some time this year. Does it have a point, social commentary, anything like that? Not really. Maybe there are a couple of accidental statements about TV and Merv Griffin, but past that it’s pure, unadulterated mayhem. Brutal sometimes, too. If you ever feel low and those crappy feel-good Hollywood movies just aren’t doing it this time, you could do a lot worse than to get a copy of this.